While Mossley's season begins to gather the dust of history, other sides are still a couple of games away from completing theirs. One such team is New Mills who are currently in a ding-dong battle with AFC Fylde for the NWCFL title and the promotion to the Unibond First Division that goes with it. So with the need to eke the season out as long as possible before the summer football drought begins, a few of us made the trip to the Miller's Church Lane ground to see them face Ashton Athletic and what could be, if results elsewhere went their way, a Championship winning game. Well it seemed a good idea on paper. In reality though it was an afternoon spent wondering which other games you could have taken in instead. My only previous experience of watching New Mills was when they played Mossley a couple of months ago in the semi-final of the Manchester Premier Cup and it's fair to say the impressions they left weren't good - both on the memory or the bodies of our players. In fact it's fair to say that some of our end of season problems with injuries can be traced back in part to this particular fixture and the Miller's overly physical approach. And sadly it turns out that their performance in that game wasn't a one off, something Ashton Athletic will attest to after their number five was forced out of the game with a nasty looking facial injury*. For a side facing a team with title aspirations, the visitors from Wigan weren't troubled too much during the course of the game. The keeper pulled off a couple of good saves but not nearly as many as you'd have expected given what was riding on the match and that was down to two reasons: Athletics extremely well marshalled defence and New Mills's total lack of creativity outside of lumping the ball up the pitch as far as possible. I said after the first five minutes of the match that it was going to be a one goal game and so it proved. It came courtesy of a defensive error twelve minutes into the second period which gave Garry Kharas the opportunity of a clean run on Athletic's goal. Being the highly prized forward that he is (or was before he dropped three levels to sign for the High Peak side - money of course not being a factor in his decision), he completely fluffed the chance the presented to him but his soon to be elbow waving strike partner mopped up his mess by rolling the ball into the net. Despite picking up the win, Fylde's victory at Bacup Borough means that the destination of the title boils down to a showdown between the two sides in Preston next week. It could be some game but I doubt it will be pretty. It's not a form of snobbery at Step 5 football. 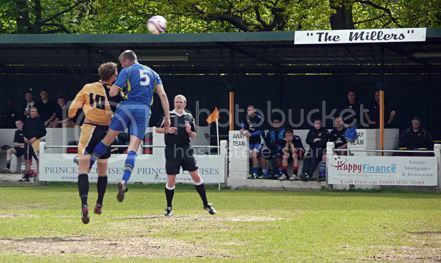 I've seen Glossop North End a few times this season and they're a good side who play good football, New Mills don't. Then again they must have something about them to be challenging for the title but I sure as hell can't see what it is. What's also galling is that after seeing and hearing about the hoops Mossley have to jump through to get a ground grading, New Mills' Church Lane ground is apparently fit for Unibond football despite making Seel Park look like Eastlands. * The injury has turned out to be a fractured cheek bone. And in a twist beloved of American cop movies, the unfortunate recipient was just thirty minutes away from retiring from football. The Third Summer Of Aargh!